I have some fancy food for you today. 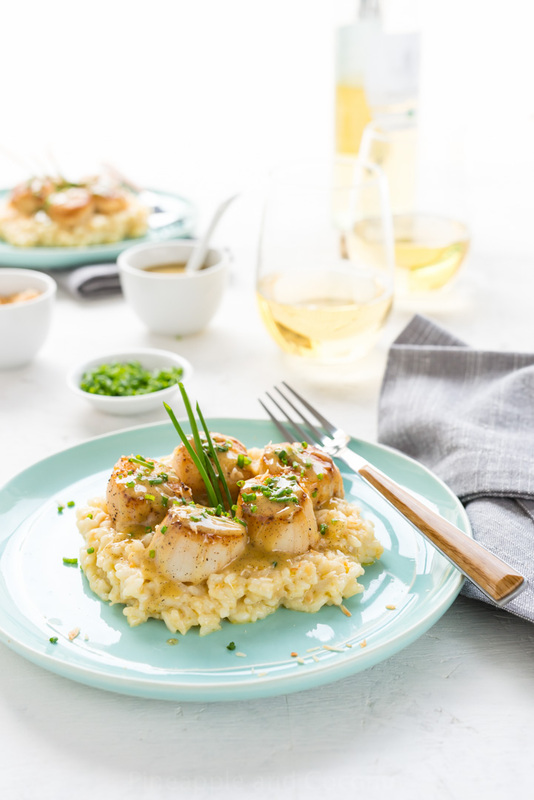 Tahitian vanilla seared scallops with lemon coconut risotto and a vanilla bean beurre blanc. Once in a while I love to cook something I would typically order in a restaurant but not make at home due to the work involved. Things that professional chefs have training on making. 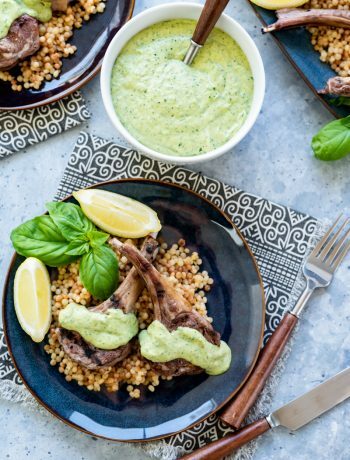 I love a good challenge and I often surprise myself at how easy recipes like these really are, not to discredit professional chefs by any means, they are way way way better than I am, but I think I can hold my own when it comes to fancy home cooking. 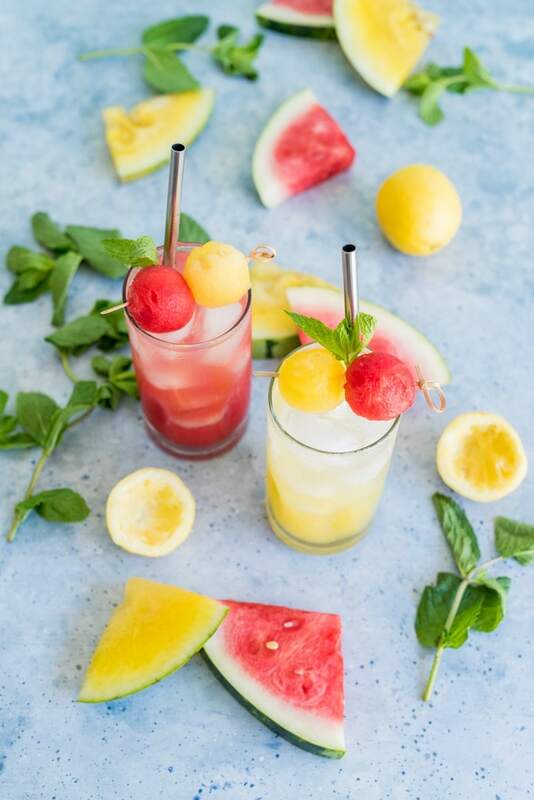 The star ingredient in this recipe is Tahitian vanilla. When the company, Vanilla from Tahiti, approached me and asked me if I wanted to work with them and create some recipe with their amazing product of course I said yes. 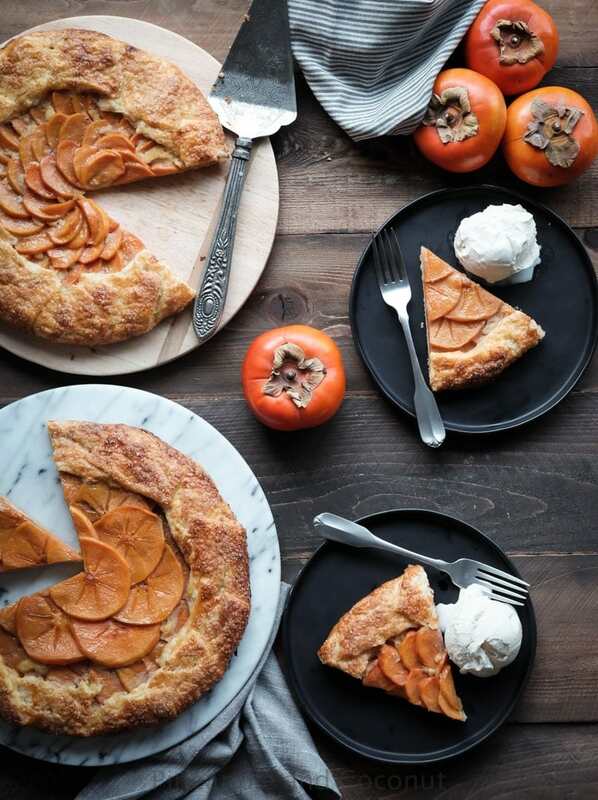 We talked about how amazing vanilla is in savory dishes, especially with seafood and shellfish, and to make something that would wow friends or family or even a date for a fancy meal at home. A show stopper meal so to speak. I started brainstorming on what I wanted to make. When the package of vanilla arrived from Vanilla from Tahiti I could smell the vanilla through the box! The aroma was amazing. Not only was the aroma even more amazing once I opened the box, the size of the vanilla beans was incredible. I have never seen such fat juicy vanilla beans before. Vanilla from Tahiti is offering my readers a discount on vanilla products which I have linked to at the end of my post after the recipe. Sweet!! So big! That one on top was half an inch across!! 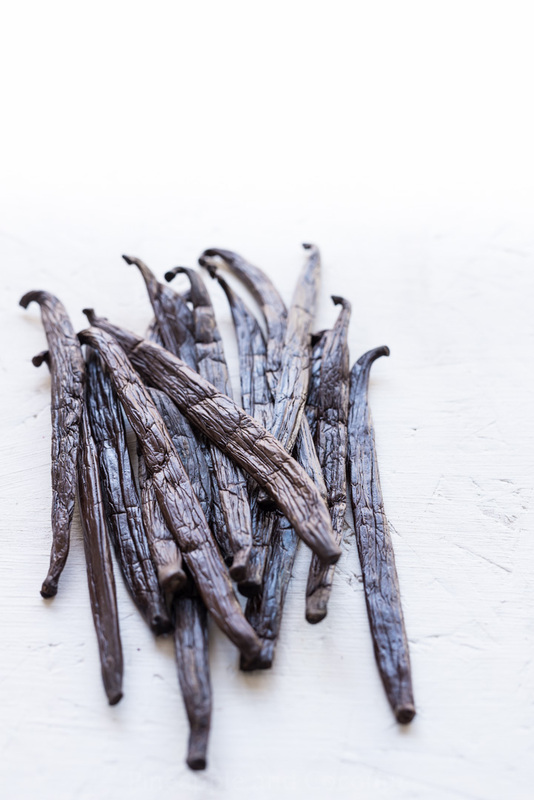 Tahitian vanilla beans are more plump, moist and sweeter than other beans. Tahitian vanilla is known for it’s heady fragrance redolent of ripe cherries, caramel, chocolate, flowers and anise. Tahitian vanilla adds depth and complexity. It brings out other flavors like chocolate and fruit and is excellent in savory cooking as well. 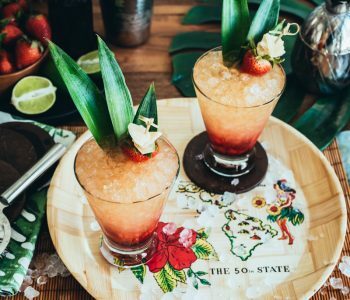 Tahitian vanilla is great in not only baking and cocktails but savory as well. The rumor that tahitian vanilla isn’t good in baked goods due to the flavor being too delicate that it gets lost is untrue, it holds up very well in baking. 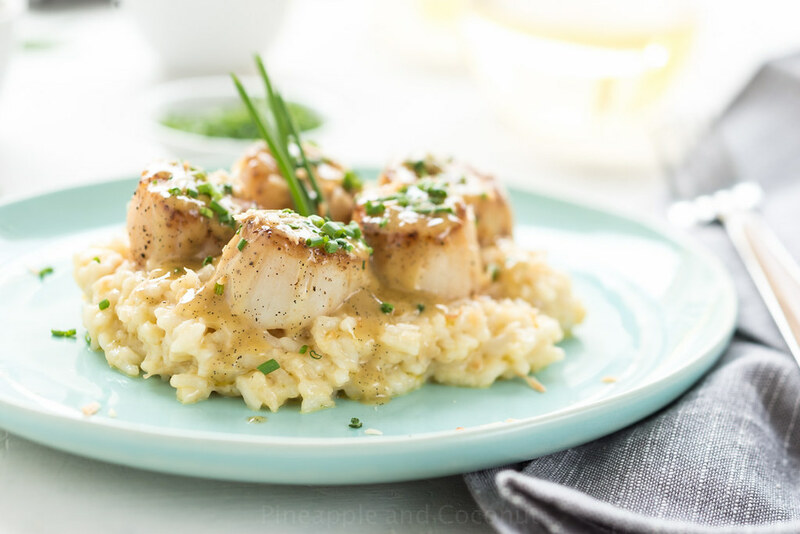 As soon as I knew I wanted to make vanilla seared scallops for this recipe with vanilla I wanted to up the fancy with the recipe and make risotto to go with it. I love risotto. Its a bit labor intensive, but the end result is so worth it. I wanted to make it with some flavors that would pair well with the vanilla and scallops but not overpower it. 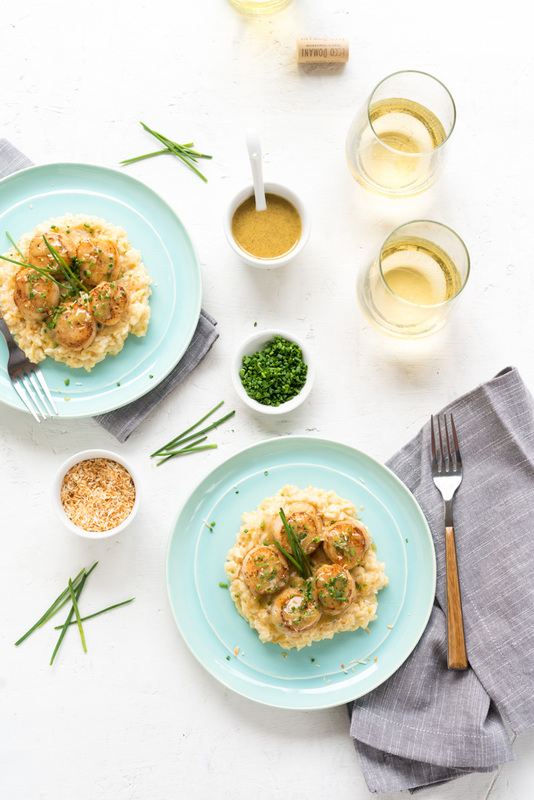 I knew that lemon goes well with shellfish and vanilla and so does coconut so I made a savory lemon coconut risotto and I am so glad I did. I probably ate a cup of it before I started photographing the recipe. Its just that good. A good friend of mine who is a professional chef gave me an awesome ” insider chef tip” for speedier risotto. She told me ” you can always par cook some with just stock for about 5 min and refridgerate or even freeze. Par cook, chill on a sheet pan, ziplock baggie and done. Then when you go to make it for your meal it will take about half the time to cook” . Awesome kitchen tip, thanks Claudette! One of the things I love about the vanilla from Vanilla from Tahiti is that all their products are 100% pure, natural, grain-free, gluten-free, allergy-free, sugar-free, vegan, kosher and most recently certified non-GMO. You know that is big in my book . The extract is made from grain free alcohol which is great news for all my gluten free friends because I have found many other vanilla extracts aren’t gluten free and with so many amazing gluten free baking recipes there are out there now its nice to know there is an option for vanilla extract in those cookies and cakes and pastries. I was originally going to make a pan sauce for the vanilla seared scallops with the sauce I seared them in but I realized it wasn’t going to be enough so I made a vanilla bean beurre blanc. A fancy French term for vanila butter wine sauce. Simple to make, most of the work is it simmering to reduce. I decided to up the vanilla quotient by simmering a vanilla bean in the sauce as it reduced. Man oh man did my kitchen smell awesome when I made this sauce. And double the vanilla on the vanilla seared scallops with the sauce took it to a another level of deliciousness. 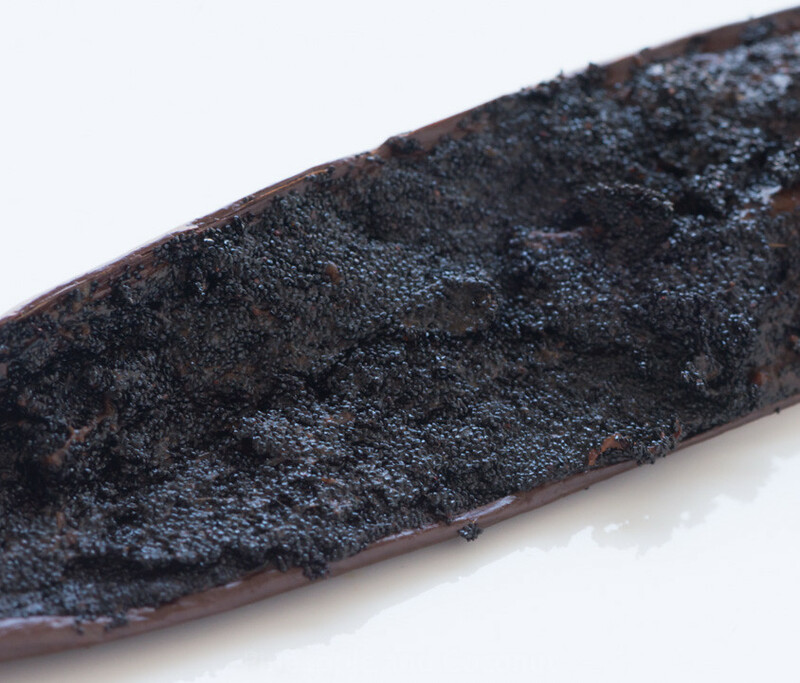 Whenever I use whole vanilla bean pods in a recipe I try to use all of the pod to get full use. I am a big fan of scraping out the seeds to whisk in at the end and steeping the pod whether its a savory sauce or a custard base for ice cream. This way all those lovely seeds or “caviar” that stuck to the pod after I scraped out the seeds make their way into the recipe. If the recipe isn’t something that requires a liquid to simmer or reduce I will put the pod in a mason jar with some sugar to make vanilla sugar. Another product that Vanilla from Tahiti has is ground vanilla bean powder. 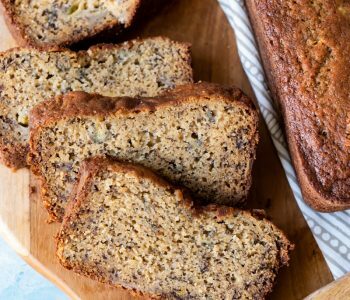 I didn’t use any in this recipe but I love using it in baking for that extra boost of vanilla flavor. I have a feeling I will be using it for another vanilla recipe for my blog in the near future. I also find it funny that vanilla is a term used for bland, plain, boring. Vanilla is anything but boring, especially Tahitian vanilla. I am a vanilla girl all the way. 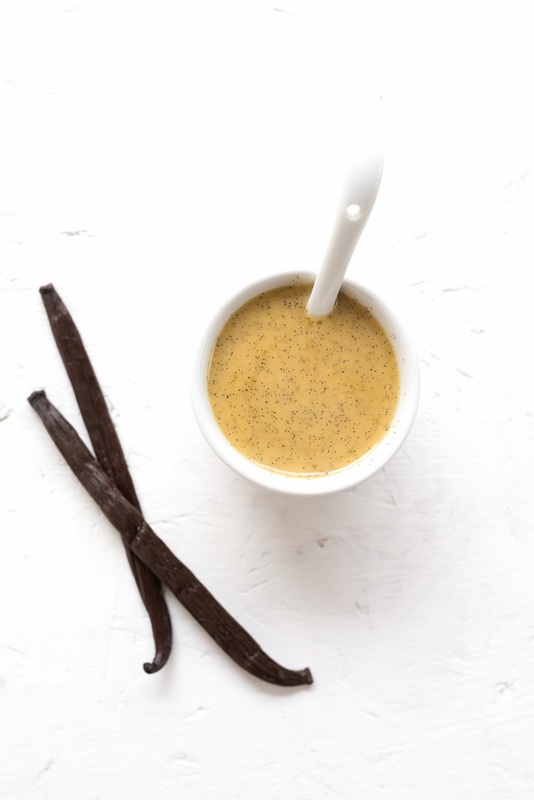 Now that you are all educated on the amazing vanilla that is Tahitian vanilla, here is the recipe. 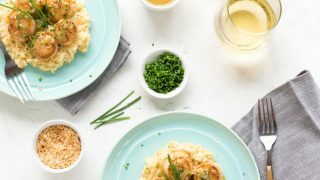 Since this is a more complex recipe than I normally post, three parts to it, I suggest reading it over a few times, making sure you have all your ingredients prepped and ready so you don’t have to worry about the risotto sticking while you are chopping shallots or searing scallops. 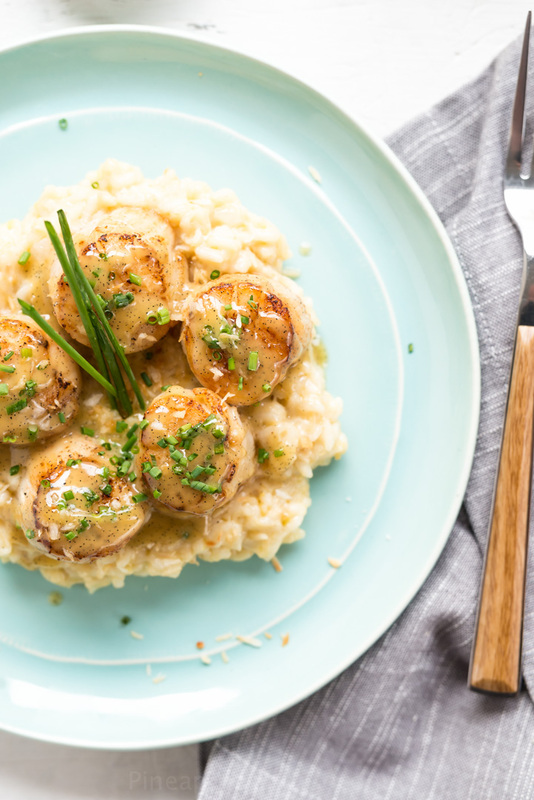 I start the risotto first and when its close to being done I make the sauce then the vanilla seared scallops. The risotto can sit in a covered pan for a little bit to stay warm while the sauce is being finished and scallops are being seared. The best way to keep the sauce warm and from separating is in a bowl over a pan of simmering water or in a thermos!! I don’t own a thermos so the water bath worked for me. Combine the chicken stock and half of the coconut milk in a saucepan and set over low heat to simmer. In a deep sauté pan, melt the coconut oil and butter. Add the onion and cook until soft, about 6-7 minutes. Add in the rice. Add in the lemon juice and wine and cook until absorbed. Add in the chicken stock mixture one half cup at a time stirring until absorbed before adding in the next half of a cup. Repeat until the rice is al-dente, not too soft, but no longer crunchy. 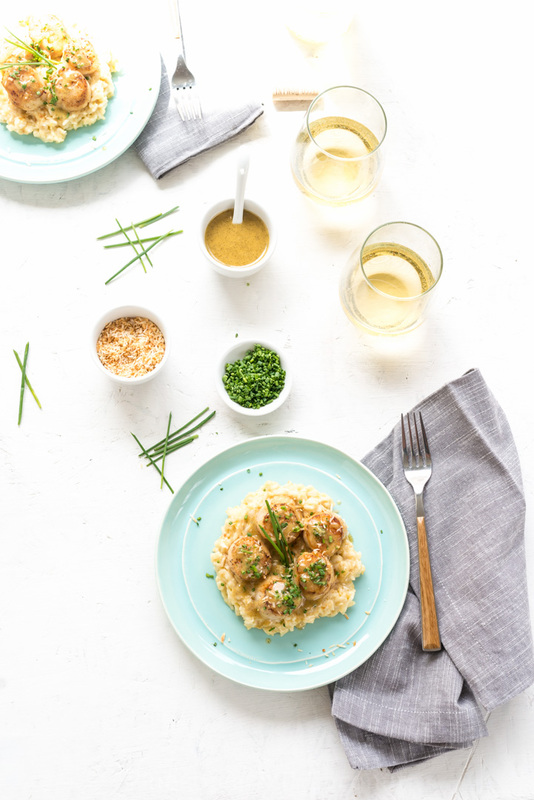 Risotto is meant to be on the firmer side. This process will take about 35-45 minutes. Once done, add in the remaining coconut milk, lemon zest, salt, pepper and half of the toasted coconut and stir. Keep warm until serving. Stir again before serving. Rinse and pat the scallops dry. Season with salt and pepper. In a small bowl melt the butter and add the vanilla extract. Heat a cast iron pan to medium high heat, add the coconut oil and melt until very hot. Add in a little of the vanilla butter. 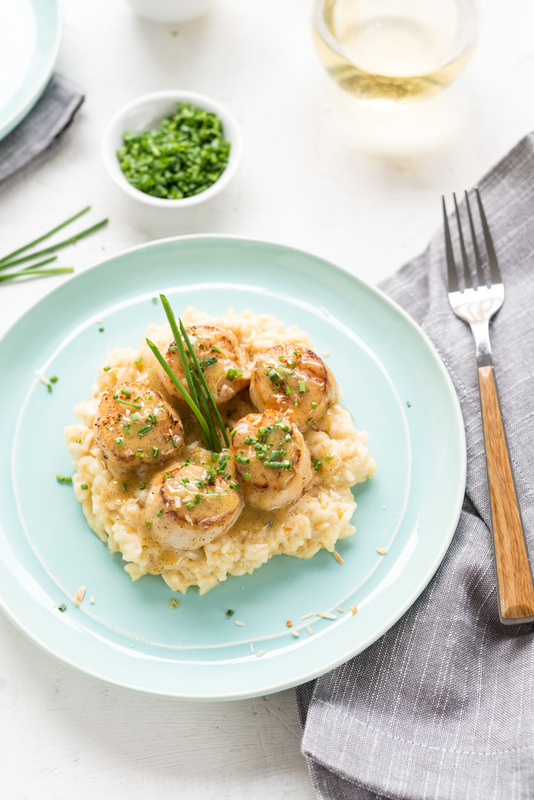 Place the scallops a couple inches apart and dab on a little of the vanilla butter, searing for 1-2 minutes, turn the scallops over and sear for another 1-2 min until the bottoms turn golden brown and caramelize a little. Depending on the size of your pan the scallops may have to cooked in several batches. 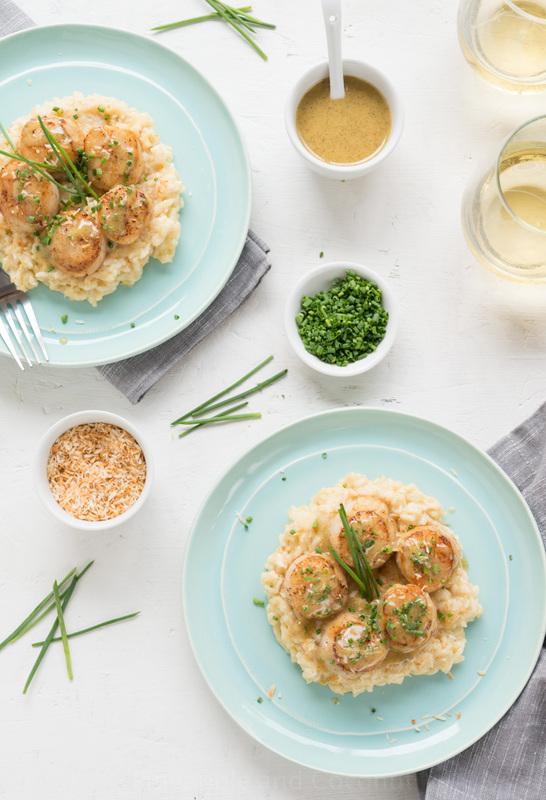 Divide the risotto amongst 4-6 plates depending on size of serving is desired, top with scallops, spoon some of the beurre blanc over the scallops and sprinkle with the remaining toasted coconut and chives. Serve immediately. Goes great with a cold crisp white wine. I want to thank Vanilla from Tahiti for sending me vanilla beans, vanilla extract, and vanilla powder to try out. It really is the best vanilla products I have ever tried, and I would love for you all to try too. 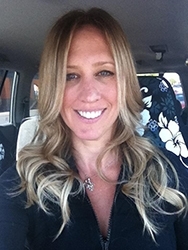 Vanilla from Tahiti is offering my readers a %15 off discount of their products. So head HERE to get the discount code. You get what you pay for with these vanilla products, the quality is miles apart from anything else I have tried before. As always opnions are my own, and I never work with brands I don’t believe or or not use their products. Vanilla from Tahiti has a permanent home in my kitchen. My wedding dinner (also a beach wedding…read your bio =) included jumbo shrimp with a vanilla bean sauce. To this day I remember the wonderful taste of the tiny half-bite I took (does any Bride get to enjoy the food they planned?). Fast-forward 14 years and my hubby and I decided that with 1st grade homework, a new kitten, and recent hurricane evacuations, we would celebrate a low-key anniversary. Still I wanted to add something special to the day. So I made your recipe using Mayport Shrimp in place of scallops (nothing against scallops, just trying to recreate the shrimp dish). Every other ingredient was the same. And wow, what a delight! We were both transported right back to that night and our daughter is stoked she got to taste the wedding dinner this time around =) While the vanilla sauce held the magic, your risotto is genius! We too love Hawaii and that risotto tastes like a Maui sunset. You rock! Thank you for posting this and making a “low-key” anniversary a meaningful one to remember. 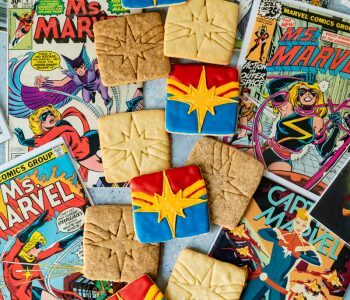 I really want to make this soon- it looks delicious! 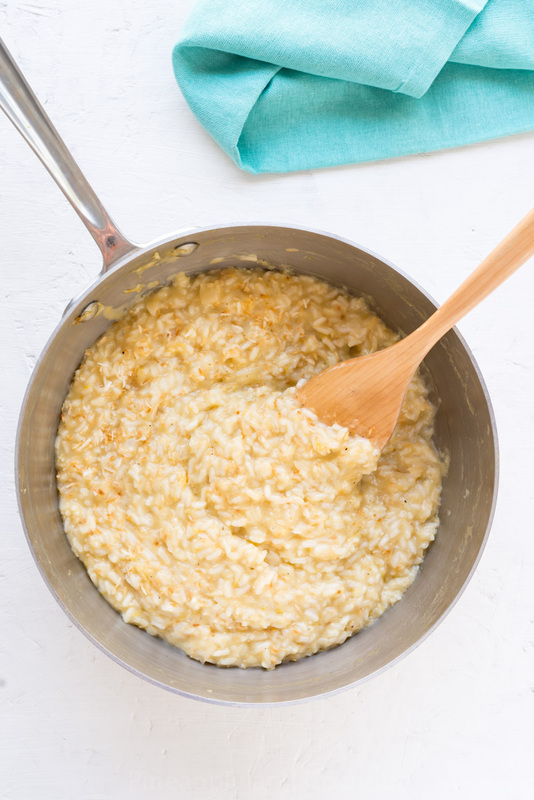 For the risotto: when do you add in the rice? I didn’t see that part in the recipe. Hi you add it after the onion. 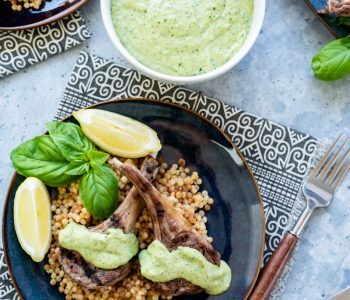 I have been having major issues with my recipe plugin and I have had to re-enter all my recipes by hand. Its been a long tedious process and I keep leaving out steps! So so sorry about that. Hope you like the recipe! This was amazingly delicious. My husband and I savored every bite. There were a few details missing from the recipe but fortunately I guessed correctly. Additionally, I did not see any mention of pineapple. We were wondering what would be a complimentary side dish and a dessert. My husband suggested apples and hard cheese. Do you have any suggestions? Thank you and aloha. I replaced the scallops in the recipe with halibut (because I had some fresh, and my scallops were frozen)and it was very good. Next time I will use scallops. I had a vanilla beurre blanc on white fish (mahi-mahi, I think) at a now-defunct mexican restaurant in Durango a few years back, and searched for a recipe, only stumbling on it very recently. I had not recalled “beurre Blanc” so I was asking for vanilla sauce for seafood and nothing even close came up. Thanks for this great recipe that I will put to good use – probably on sea bass or maybe shrimp if I can find some that are really good. Keep up the good work! Oh I like the idea of using halibut – that is one of my fave fish to eat. I will have to try that. Thank you so much!